By popular demand! 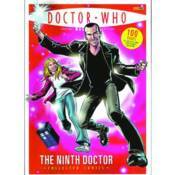 An outstanding volume of comic strips collecting the complete adventures of the ninth Doctor (played on TV by Christopher Eccleston) and Rose Tyler (Billie Piper) from the pages of Doctor Who Magazine. Featuring five complete stories from the acclaimed writers of the Doctor Who television series Gareth Roberts and Robert Shearman, and also by Doctor Who Magazine writer Scott Gray, this volume includes a wealth of exclusive, brand-new material revealing how the strips were created, featuring contributions and commentary from the writers and artists.